Come together for Smith today! 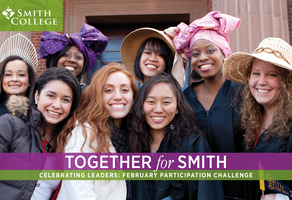 Smith College educates women of promise for lives of distinction and purpose. A college of and for the world, Smith links the power of the liberal arts to excellence in research and scholarship, developing leaders for society's challenges. 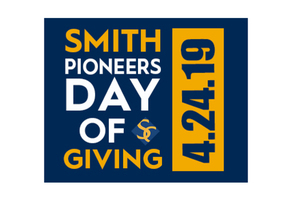 Join us Wednesday, April 24 for Smith Athletics 2019 Giving Challenge, a 24-hour competition to support Pioneer Athletics. We’re always better when we stand together for Smith! Your participation will help us earn a challenge match from the Board of Trustees. Graduates of the Last Decade (GOLD) can help Smith earn a $5,000 match for Smith student orgs for diversity and inclusion programming. Give This Season's Most Powerful Gift. Empower Smith Students To Launch Bright Futures On Smith's Campus. Make an impact at Smith College! Connect with other Smithies on GiveCampus! Class of 2013: Start the Semester with Smith! Class of 2006—Show Your Love! Class of 2000: Why Do You Give?